Use pie crust cutters for a professional effect. Photo courtesy Williams-Sonoma. 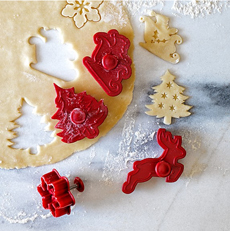 Make your holiday pies Christmas-special with decorative crust cutters. The cutters make it easy to add seasonal fun to your pies. 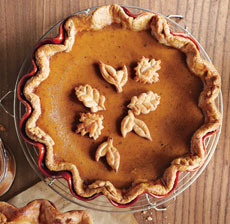 Just press them into the dough to form appliqués to go atop the pie, or to create cut-out designs in a pie’s top crust. You can also use them to garnish soups and salads. Or, cut out cookie dough for a dessert garnish. This year’s exclusive cutter set from Williams-Sonoma includes a Christmas tree, reindeer, Santa in sleigh and a snowflake. The shapes change yearly; you can build a collection of festive shapes over time. The durable spring-loaded cutters are designed for maximum precision, safety and easy of use. The spring mechanism creates delicate shapes embossed with fine detail. Even a child can use them. Get yours at Williams-Sonoma stores or at WilliamsSonoma.com. Give a set to your favorite pie baker. For fun, color the dough red (for Santa), green for leaves, etc. Here are lots of tips for making pie crust cut-outs from King Arthur Flour, including helpful photos. A Thanksgiving pie using fall-themed cut-outs. Photo courtesy Williams-Sonoma.